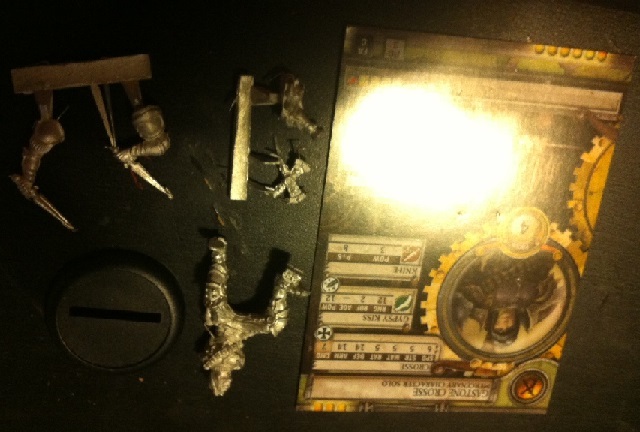 Free Llael Friday – Warmachine Kickstarter Mercenary Gastone Crosse Unboxing | Blood Shines Gold And All Coin Spends. So to go with the restarted progress on the Magnum Opus the Warmachine Tactics kickstarter exclusive warcasters arrived. I didn’t back myself, but a friend did, so I piggybacked to get the latest addition to the brave resistance! So this is an Unboxing (or unbagging in this case) and I’ll put the finished painted miniature up once he’s done. The model is in 5 pieces, body, arms, dagger sheaths and turbine, and my first thought (especially as I’ve been doing lots of spartan recently) was that it was flash-tastic! However it was all relatively easy to clean up and one it was done the result was excellent. This is a great model, far nicer I think than the normal version, it’s nice and dynamic with lots of detail and looks like it’ll be fun to paint. My only wariness is the daggers, they’re nicely done and well posed, but I’m worried they’ll be a little fragile. I’ll have a further update once I’ve got him painted! What does everyone else think of the new character junior casters? Comments, as ever, are welcome. Just started painting Commander Sturgis, and is also a very detail model. Suitably impressed. I feel after doing some spartan stuff recently that other companies have raised their game, nice to see privateer keep up!